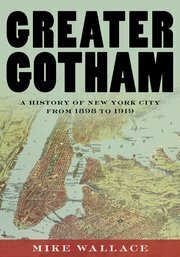 I had no idea that we were anywhere close to getting a second installment of the greatest history of New York City ever, but it turns out we are, and it’s out next week! My only worry is that I won’t live long enough to finish it, but given that every day lasts a year now it might be easier than I think. Here’s an interview with author Mike Wallace, who “is poised to complete Volumes III and IV.” !!! I mean, I definitely won’t make it for those but it’s still nice to know that you guys will get them.